Sunday, APril 23, at AC Stelle middle school in calabasas. Over 50 camps on display! Looking for a camp, school or program for your kids this summer? 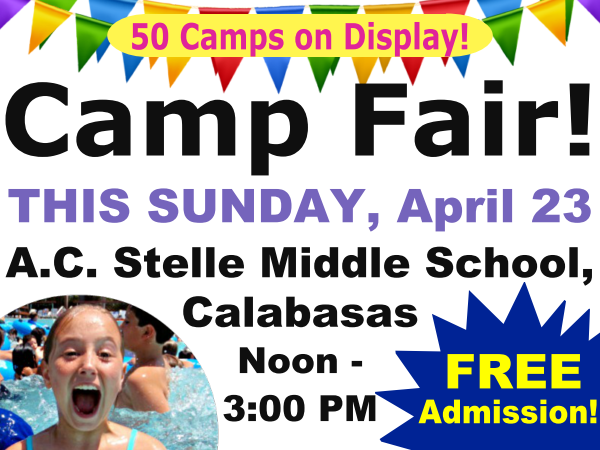 Don't miss the L.A. Camp Fair on Sunday, April 23 AT A.C. sTELLE MIDDLE SCHOOL IN CALABASAS! Admission is FREE and you'll discover an array of amazing day, overnight, and specialty summer camp opportunities all in one place. A Camp Fair is a live event where prospective campers and their parents can learn about many different summer camp opportunities and meet and speak with representatives from participating camps and programs all in one place. Over 50 camps will be attending L.A. Camp Fair 2017 on Sunday, April 23. Think of it like an expo for summer camps and you're on the right track. Over 50 camps in attendance from day camps to sleepaway camps to specialty camps to academic camps and more! What Kinds of Camps Will Be There? All kinds! We're talking day camps, overnight camps, sports camps, and all kinds of specialty camps ranging from beach to music camps to cooking camps and more. Rather than spending time contacting camps that interest you individually, you can go booth-to-booth meeting all the camps and seeing what they have offer in person. It's a one-stop-shop for finding the best summer camp for you! Which Camps Will be There? How Many Camps Will Be On Display? You can expect to see at least 50 summer camps or more at the April 23 Camp Fair, maybe even more. There will be programs to suit every child's interest. Even if you've attended other camp fairs recently, we guarantee there will be a wide array of new and exciting programs at the L.A. Camp Fair which you have not seen before. Attending this event is your best opportunity to find a great camp for your child! When Does the Camp Fair Take Place? Sunday, April 23, 2017 from 12pm to 3:00pm. Activities are ongoing and admission is FREE, so you can arrive any time between those hours. Drop by for just a little while or stay the whole time! Admission is absolutely FREE! However, due to expected high demand, you will need a ticket to get in. Print your free tickets for the April 23 Camp Fair today! How Do Camps Sign Up to Attend? If you run a summer camp, school or program and would like to sign up for an exhibitor booth at the Camp Fair, please fill out this registration form. If you need questions answered before signing up, please email us at lasummercamps.com@gmail.com. Thanks!